U.S. Secretary of State John Kerry and Russian Foreign Minister Sergey Lavrov pose for a photo before a Middle East Quartet Principals Meeting during 71st Session of the United Nations General Assembly in Manhattan, New York, U.S. The bombing of the UN humanitarian convoy on Sept. 19 and the upcoming U.S. elections are straining the prospects of Russia-U.S. cooperation in Syria, say Russian analysts, arguing that Pentagon officials are preparing for a more hawkish U.S. administration. U.S. Secretary of State John Kerry abandoned his usually receptive manner after the bombing of the UN convoy in Syria on Sept. 19, according to Russian foreign minister Sergei Lavrov, who blamed the U.S. military establishment for putting pressure on Kerry in an exclusive interview with the Russian TV channel NTV on Sept. 26. “Apparently he is being pressured strongly because he is under severe criticism from the U.S. military machine,” said Sergei Lavrov, commenting on claims by Kerry that Russia was behind the bombing of the humanitarian convoy in Syria. The Russian foreign minister suggested that the Pentagon does not uphold the views held by President Obama who, according to Lavrov, supported cooperation with Russia. It remains unclear from the interview whether the Russian foreign minister was alluding to an unrealised Russia-U.S. attempt to routinely share military intelligence on targets in Syria. “Apparently, the [U.S.] military does not pay a great deal of attention to the commander-in-chief,” said Lavrov. Was the Syria deal doomed from the start? 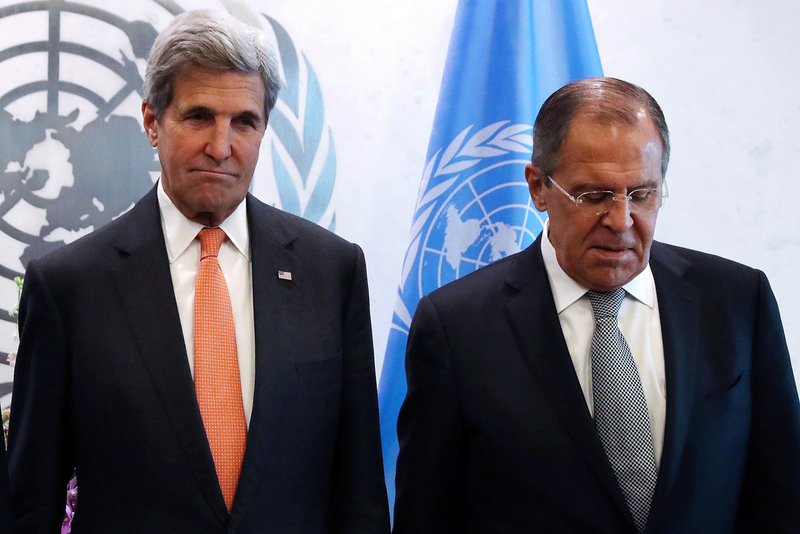 Tensions between the U.S. and Russia heightened after a UN convoy carrying humanitarian aid to a rebel-held part of Aleppo was bombed on the evening of Sept. 19, undermining the understanding that Lavrov and Kerry had seemed to cultivate via a series of high-level meetings. Russia has dismissed accusations voiced by U.S. officials, who blame either Russian or Syrian government forces for the bombing. Lavrov’s interview suggested that the accusations of bombing the UN convoy contribute to a sense of mutual distrust between the U.S. and Russia and, to some degree, open up a window of opportunity for those in the U.S. bureaucratic establishment who find cooperation with Moscow implausible and are lobbying for a more hawkish approach to the Syrian conflict. “While Kerry believes progress can be made by reaching out to leaders, as has happened in environmental policy with China, and in the chemical weapons deal on Syria with Russia, others in the U.S. government are far more skeptical,” said Jack A. Goldstone, professor of public policy at George Mason University and a non-resident Senior Fellow at the Brookings Institution. Although a majority of the analysts polled by RBTH believe Kerry has Obama’s full support to handle the Russian side the way he has been doing it, the administration has felt steady pressure to adopt a more confrontational policy in Syria, according to some experts. “The pressure the president has been under from within his own bureaucracy seems, just looking from the outside, to have been enormous,” said James Carden, a contributing editor to The Nation, who previously served as an advisor to the U.S.-Russia Presidential Commission in the U.S. State Department. Although Obama appears to back Kerry’s effort at reaching an agreement with the Russians on Syria, he may refrain from insisting on it order to maintain an inter-agency balance, according to some of the experts interviewed by RBTH. “So far the administration has been inclined to more frequently side with the first but once in a while has to adopt some of the proposed ‘harsh measures’ in order to not alienate the powerful military-intelligence faction,” said Max Suchkov, an expert at the Russian International Affairs Council and a columnist on Russian affairs for U.S. news website Al-Monitor. Did Russian planes bomb the UN humanitarian convoy in Syria? The Pentagon may also be putting pressure on Obama in the view of the coming change in the White House. “Many in the U.S. are guided by the perspective of the next president, believed to be Hillary Clinton. She advocates a tougher way of dealing with Russia in Syria. Apparently, [U.S. Secretary of Defense] Ashton Carter’s people want to preserve their offices in the future and adjust their current actions accordingly,” he said. A majority of the Russian experts interviewed by RBTH referred to the internal debates within the U.S. bureaucratic establishment as a “typical and normal” state of affairs, not necessarily deadlocking prospects of Russia-U.S. cooperation in Syria. Diplomats may still have a window for maneuver even though the incident with the UN convoy has damaged the prospects of solidifying earlier agreements. “Interaction between Russia and the U.S. may well be maintained on an operational level. Binding and documented agreements are not necessary [for maintaining a working contact in Syria]. But if such an agreement is reached, it will be coordinated amongst all the governmental structures,” said Ivan Timofeyev, a program director for the Valdai Discussion Club and the Russian International Affairs Council. Read more: Why not give the Syrians a break?